There are a number of medicinal herbs that have a long history of use as a natural treatment for fever, as well as traditional herbal combinations that are pleasant to the taste and provide a number of benefits when suffering from fever and chills. In holistic tradition, herbs are not used to reduce fever unless there is also some positive benefit in treating the infection or inflammation that is causing the fever. Many alternative practitioners see fever as the body’s natural response to a pathogen. Fever has been shown to stimulate immune system production of antibodies and may also enhance the body’s elimination of toxins. Fevers accomplish much for the body through stimulation of the circulation of both blood and lymph, bringing lymphocytes, immune globulins, and other infection-fighting agents to fight the cause of the disease. Fever also enhances the removal of lysed cells (cell death by breaking of the cellular membrane, often by viral or osmotic mechanisms), spent and infected cells, to be processed by the liver, spleen and lymph nodes. Other than those cases where a fever is too high, if a fever is suppressed, the individual loses the advantages from the body’s natural defense system, and the illness may last longer. Therefore, herbalists try to use herbs that support the immune system and enhance other cleansing processes of the body. Diaphoretics help to lower body temperature by promoting perspiration and detoxify the body. Circulatory stimulants increase blood flow to the skin and enhance the cleansing sweat. Alteratives (herbs that restore function to the body by way of the metabolism) may act through an anti-microbial action, through stimulation of the immune system, and help the body clear out the toxins. 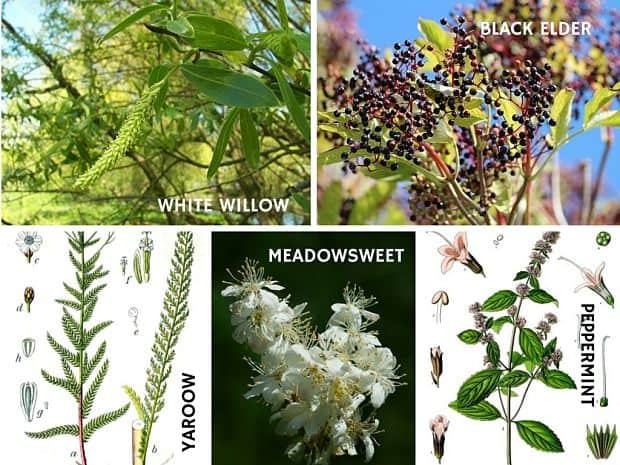 Herbs such as willow, meadowsweet, black haw, cramp bark, birch, black cohosh, and Indian pipe contain some derivatives of salicylic acid, and are often called “herbal aspirins”. While aspirin and its chemical relatives are harsh on the stomach, the salicin found in herbs is not nearly as strong as acetylsalicylic acid (aspirin) and the action of herbs for fever reduction is much different from synthetic aspirin. Like aspirin, herbs can act as inhibitors for inflammation-causing prostaglandins, but often they achieve this by addressing the imbalance that leads to an elevated incidence of prostaglandins. Herbs containing salicin (aspirin-like herbs) should never be used to treat a fever in children or those who are allergic to aspirin. There are a number of other herbs and herb combinations that do not contain salicin yet are effective as a natural treatment for fever. It is important to monitor a high fever and seek medical attention if the fever reaches a critical level. If a fever reaches a certain level, it must be quickly controlled. A fever that reaches or exceeds a critical level requires immediate medical attention. White willow has been used for thousands of years by Chinese physicians. A tea made of willow bark is perhaps the best-known natural treatment for fever and pain. An active compound is salicin, which was isolated in 1830 and converted to aspirin, one of the most popular modern drugs. The bitter taste of the willow bark can be disguised with cinnamon, ginger, chamomile, or any of a number of savory herbs. Meadowsweet is an excellent source of salicin, although less well-known than willow bark. It is an excellent treatment for fever and provides relief from the pain of rheumatism. Unlike aspirin, it is gentle on the stomach and considered by some herbalists to be one of the best herbal remedies for digestive ailments. Yarrow is a standard herb used to promote perspiration, eliminate toxins, and reduce fever. It contains salicylic acid and induces sweating by opening the pores. As an herbal remedy for fever, it combines well with elder flower, peppermint, boneset, cayenne and ginger. The elder tree flowers are highly regarded as a natural treatment for colds and influenza. The tea or [easyazon_link identifier=”B00KLH0K52″ locale=”US” tag=”herbal-resource-20″]tincture[/easyazon_link] is especially valuable as a treatment for spiking fever in children. Elder flowers are thought to aid the process of fever by relaxing capillaries, opening the pores of the skin and relieving congestion. The flowers or berries may help eliminate toxins by promoting sweating and act against inflammation of mucous membranes, especially of the nose and throat. Peppermint is valuable as an herbal remedy for fever. It has the added benefits of being considered a beneficial herb for the digestive system and is nervine that eases anxiety and tension. It may be used in combination with boneset, elder flowers, and yarrow. Ginger root is a useful herbal diaphoretic (promotes perspiration) that is used as a natural treatment for fever. It is a natural stimulant of the peripheral circulation and combines well with a number of other herbs that are useful for treating fever. Boneset is used to treat fever, aches, and pains associated with influenza. 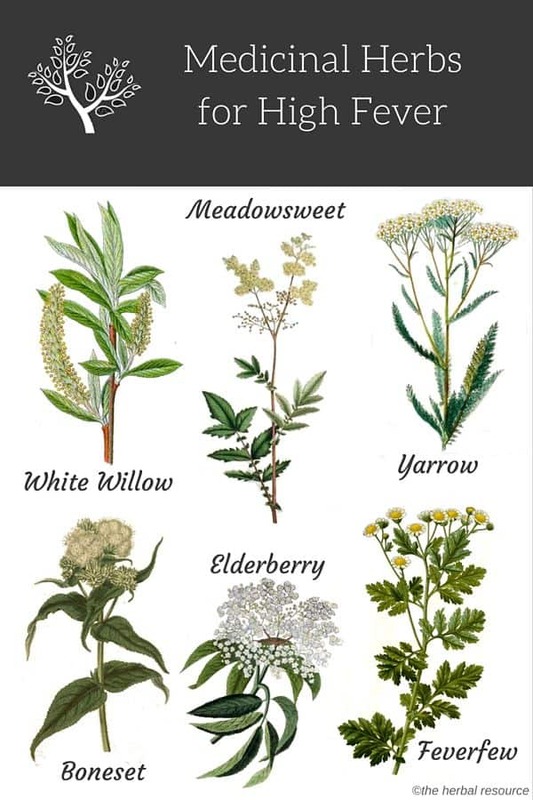 It combines well with yarrow, elder flowers, cayenne or ginger. The root of another herb in the Eupatorium family, spotted Joe Pye weed (Eupatorium maculatum), was used by a 19th-century herbalist to induce sweating in typhus fever. Feverfew is anti-inflammatory, vasodilatory, relaxant, antiseptic and digestive bitter. It has a long history of use in the treatment of fever, migraines, and arthritis. Echinacea is one of the most common herbal treatments for infection and fever. It is valuable as an anti-viral, anti-microbial and immune-stimulant herbal treatment that can be used for all ages including children. Catnip is traditionally used as a cold and flu remedy, having a strong diaphoretic quality that is useful in any feverish condition. Its sedative influence on the nerves adds to its soothing quality. Catnip combines well with the pleasant taste of mint and sage for a pleasant herbal remedy for fever. Other natural herbs that have been used for treatment of Fever.